February is a crossover month between the winter jobs and the busy gardening jobs of spring. There is still time to do some winter pruning as long as the month is cold enough for the new shoots to hold back. March is such a frantically busy month in the gardening calendar, so get a few jobs cleared this month in readiness for it. My perennial grasses were great through last year, and I’ve already cut back the Stipa gigantea. But it’s towards the end of February that I cut back the other grasses to tidy them up and allow the new growth to come through. One of my real favourites at the moment is Panicum virgatum “Rehbraun” – this perennial grass doesn’t do much early in the year, but towards the end of the summer the tops of the leaves turn a lovely reddish-purple colour and it produces masses of seed heads that stay on all winter. I allow mine to mix in with the perennials that are flowering at the same time. Once you have cut back the old growth, just give the whole base of the plant a good mulch with well-rotted compost. The other perennial grass I have in my butterfly border is Miscanthus sinensis “Morning Light”, a tall grass that grows to around four feet high but is not at all invasive. It has a graceful habit and variegated leaves. I’ll also be cutting this back to the new growth this month and then mulching it. If you wanted to split either of these grasses when they get too congested, you could dig them up in March and split them like you would most other perennials, dividing them into smaller clumps – this will give you more plants to put back in the border too. As one of the winter jobs, do give your greenhouse a good clean this month, and many gardeners recommend washing old pots (if you have the time). I’m actually having a new (well, new to me, as it is recycled) greenhouse this winter and just hoping it will be up in time for planting in March. February is also the month to order and sort seeds for the coming spring; make sure you order any seed potatoes early so you get the variety you want. Hopefully you will have made notes on what varieties did well last year, so you can re-order the same – or, as I do, regularly save the seed and dry it for planting the following year. I’ve done this with my favourite runner bean which is called The Czar. I was still picking the dried beans in late October and using them in soups and stews. I also like to grow a purple podded French bean and this year I’m going to try a new one. 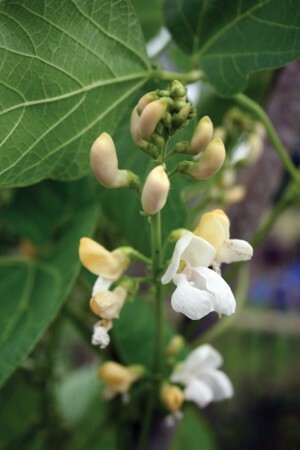 It’s called “Blauhilde” Climbing and, like The Czar, you can pick the beans young and tender – but if you miss a few, the larger beans can be shelled and used as flageolet beans. I’ll let you know how I get on with this variety. Plant broad beans now if you haven’t done them in November. The beans called Aquadulce are very reliable, but if you want to try something different, Red Epicure has crimson seeds that keep their colour even when cooked. Plant this variety at the end of February. Before the end of this month, dig over any vacant plots, removing any weeds and planning your crop rotation of what will grow where. Some beds might need the addition of some well-rotted manure to get them prepared for spring sowing of beans and courgettes. Make sure the manure you are applying is at least two years old; this ensures the nutrients are available to the plants this year and won’t deplete your soil of nitrogen. This is also the best month to sow onions from sets. They are easy to grow but just might need a bit of protection from birds in the first few weeks, as they tend to pull up the brown shoots before they anchor down with roots. Hopefully you got around to pruning fruit bushes in the autumn of last year. Autumn raspberries need a prune this month – cut all the stems to the ground and give a good feed with well-rotted manure. Plant rhubarb now or split old plants that have got very poor and replant them, throwing away the centre of the plant and only replanting the outside parts that are younger. Mulch your rhubarb plants to make sure they have all the nutrients they need. Nectarines and peaches need some protection now to ensure they don’t get peach leaf curl. For wall-grown fruit, build a simple framework and hang plastic or fleece over the plant. Whatever your jobs this month, it’s a good time to enjoy the slightly longer days.